Hide deals from seller "Ashkenaz Deli"
Hide deals from category "Delis"
No limit per person. Valid on deli sandwiches only. Promotional value expires 60 days after purchase. Satisfy your lunchtime cravings with 30% off deli sandwiches from Ashkenaz Deli in Chicago's Gold Coast neighborhood ($10 value). 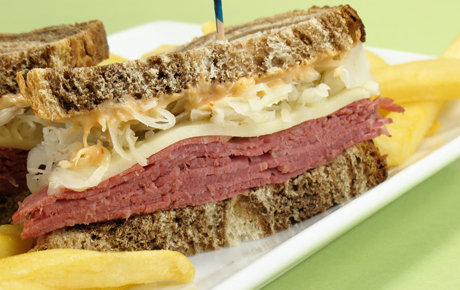 This Jewish-style deli offers delicious sandwiches piled high with fresh meats and cheeses. Ashkenaz Deli has been in business for an impressive 70 years and continues a tradition of high-quality food based on family recipes. Their deli sandwiches are sure to appease your appetite. They offer a variety of savory meats like corned beef, pastrami, turkey and salami. Top off your sandwich with Swiss, Muenster, American, cheddar or provolone cheese. You can also select your choice of bread from eight varieties including favorites like marble rye, wheat and kaiser rolls. Create your own custom creation or choose from Ashkenaz Deli's signature sandwiches. A deli in Gold Coast that uses traditional family recipes and fresh ingredients.